“He has a timeline. We’re operating under that timeline,” a top Biden aide said. But as some other potential Democratic hopefuls quickly pivoted to begin laying the groundwork for a White House run, the former vice president, who turned 76 on Tuesday, remains in a holding pattern. The Biden family prepares to celebrate Thanksgiving as the paperback version of his 2017 book, “Promise Me, Dad,” hits shelves. The first-person account of Biden’s closing months as vice president is centered around his eldest son Beau’s brain cancer diagnosis, and the impact Beau’s death had — and continues to have — on the Biden family. It's the single biggest factor that kept Joe Biden out of the 2016 presidential race, and aides say it may keep him out of 2020 contention, as well. Next month, the same weekend that New Jersey Democratic Sen. Cory Booker travels to New Hampshire, the first-in-the-nation-primary state, Biden will be in neighboring Vermont closing out a promotional tour for the paperback. It will be his main public engagement until he makes a final decision about his political future. “It will be a family decision. And we have time,” Biden said after casting his ballot in Delaware earlier this month. Democrats’ 2020 field could number in the dozens, and the decision from Biden, more than any other Democratic heavyweight, will determine how large it becomes. A close-knit team of aides has been working quietly to put Biden in position to wage a presidential campaign if he chooses to do so. But their preparations can only go so far without a final decision, expected by mid-January. 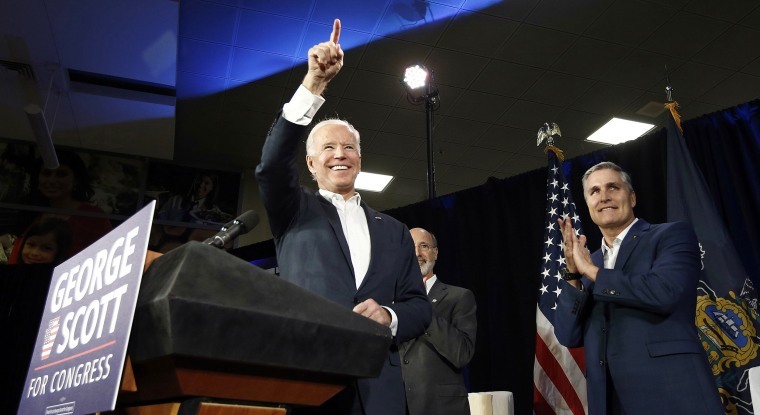 A top Biden aide told NBC News that Democratic operatives eager to join a Biden campaign have been reaching out to the political team. Some say they’ve received offers from other potential contenders — Booker was interviewing potential campaign managers just last week — but that they would hold out for Biden if he’s going to make the jump. No commitments are being made, the aide said. “He has a timeline. We’re operating under that timeline,” the aide said. What are Joe Biden's strengths and weaknesses as a potential Presidential candidate? Biden campaigned in the midterms with gusto, holding a dozen events in the closing week. He made calls throughout election night from to some 40 candidates he had campaigned for or endorsed — and at least one to a prominent Republican: Sen.-elect Mitt Romney of Utah. Biden has many other advantages with key early state activists, said the operative — who has been in touch with multiple potential campaigns and requested anonymity in discussing the field.